Descartes Technologies are specialists in Error Proofing and quality control systems for manufacturing. 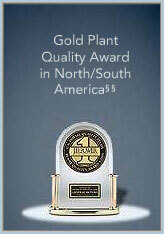 Plants that rely heavily on our solutions consistently take Gold Medal awards in JD Powers initial quality rankings year after year. Regardless of what automation your plant uses, we can provide solutions that integrate seamlessly with your existing equipment and ensure your process is 100% in spec, 100% of the time. Does your production line produce a variety of products mixed and coming down the same line? This isnÃ¢Â€Â™t a problem, we can provide solutions that integrate with your production schedule and adapt to changes in production order in real time. Along with sensible operator interfaces that provide feedback in real time, our solutions can include process data collection and reporting valuable for root-cause analysis, defect tracking and warranty related product identification. Whether itÃ¢Â€Â™s a large scale centralized system managing 100+ operations or simple low cost stand-alone solutions, we can give you exactly what you need. Contact us today to find out how we can help you with your error proofing needs.